Mikkel 'Mix' Diskerud got himself on the USMNT radar after emerging as a youth player in Norway. Born in Oslo, Mix represented Norway at the Under-18 and U-19 level before opting for the United States youth National Team program. Mix's mom is American, offering him dual nationality and a pick of National Team programs. As a club player, he joined Staebak's first team in 2008 after three years with the club as a youth player. Mix moved to Rosenborg in 2012. In 2015, he moved to MLS as a member of the expansion NYCFC. Diskerud transferred to Manchester City in 2018 and went on loan to IFK Goteborg. He then moved to Ulsan Hyundai in the Korean league. 2016: Started against Canada on Feb 5. Started the World Cup qualifier against Guatemala on Mar 25. 2015: Started against Chile on Jan 28 and Panama on Feb 8. Started against Mexico on Apr 15. Subbed on against the Netherlands on Jun 5. Started and scored against Germany on Jun 10. Started against Guatemala on Jul 3. Started the second game of the Gold Cup group stage against Haiti on Jul 10. Subbed on against Jamaica on Jul 22. Subbed on against Peru on Sep 4, Brazil on Sep 8, and Costa Rica on Sep 13. 2014: Started for the USMNT against Korea on Feb 1. Named to the final World Cup roster. Subbed on against Azerbaijan on May 28th and scored. Subbed on against Turkey on June 1st and Nigeria on June 8th. Started against the Czech Republic on Sep 3. Started against Ecuador on Oct 10 and scored. Started the Oct 14 friendly against Honduras and against Colombia on Nov 14. Started against Ireland on Nov 18. 2013: Member of the USMNT Gold Cup squad, scoring against Costa Rica on Jul 21 and subbing on in the first-half in the final on Jul 28. 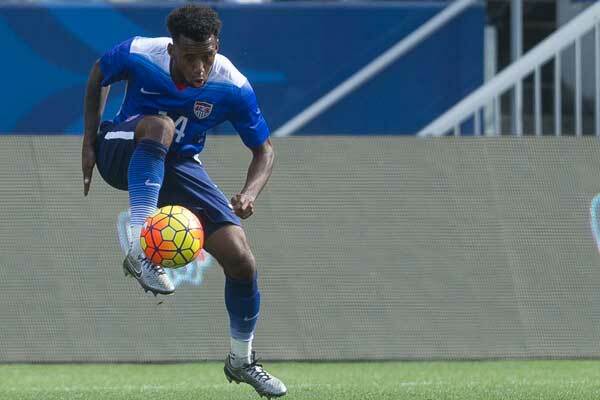 Mix's appearance against Belize in the group stage cap-tied him to the United States. Started against Bosnia and Herzegovina on Aug 14. Subbed on in the second-half against Mexico on Sep 10. Started against Jamaica on October 11 and Panama on Oct 15. Subbed on against Scotland on Nov 15 and Austria on Nov 19. 2012: Scored in his one appearance in the 2-2 draw against Russia in Krasnodar on Nov 14. 2011: Had one appearance for the USMNT. 2010: Made his debut for the USMNT against South Africa on Nov 17. 2018: Signed with Manchester City and went on loan to IFK Goteborg. Went on loan to Korean club Ulsan Hyundai in July. 2017: Went on loan to IFK Goteborg, playing in 29 games and scoring five goals in Sweden's Allsvenskan. 2016: Played in 12 games for NYCFC. 2015: Signed with MLS and joined NYCFC for their expansion season. NYCFC finished out of the playoff places in the East. 2014: Finished 2nd in Norway with Rosenborg, leaving the club at the end of the season. 2013: A member of Rosenborg, signing an extension with the club in February for the 2013 season. 2012: Spent part of the season on-loan with Gent, leaving Staebak for Rosenborg on Aug 9. Mix had 81 appearances with ten goals over four seasons with Staebak and six games with Gent while on loan in 2012. Staebak were relegated at the end of the season. 2011: Finished 10th with Staebak. 2009: Finished third, qualifying for the Europa League. 2008: Debuted with Staebak's first team in Norway's topflight. Won the league and qualified for the Champions League.